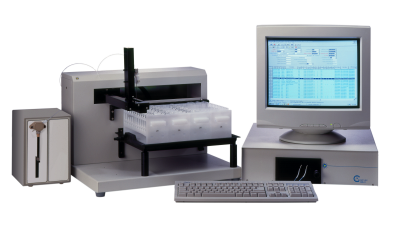 Chemchek's Kinetic Phosphorescence Analyzer (KPA) provides sensitive, precise and economical analysis for trace uranium and lanthanides. The fast and easy to use KPA measures and analyzes laser induced phosphorescence related to the analyte concentration as a function of time. Achieve highly specific analyses for uranium down to 0.01 µg/L with an analytical range of over 500,000. The ASTM D5174 Standard Test Method for Trace Uranium in Water by Pulsed-Laser Phosphorimetry is based on KPA. Copyright © 2009 Chemchek Instruments, Inc. All Rights Reserved.